(L to R): Steve Lunn, Laurie Wehner-Evans, and Dave Kasarda. Photo Courtesy of NWIndianaLife.com. 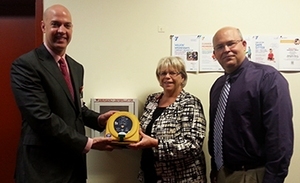 The AED was donated to the club by Porter Health Care System and presented by the company’s CEO, Steve Lunn, and Director of Community and Corporate Wellness, Laurie Wehner-Evans. The club is very thankful for the donation and glad to have the device on-hand in the event of a SCA: “On behalf of the Duneland Family YMCA, I would like to thank Porter Health Care System for the generous donation. There have been too many recent stories of athletes – young and old alike – with undiagnosed heart problems dying on the courts and fields,” says Dave Kasarda, Executive Director of Duneland Family YMCA. With 84 percent of SCA events occurring outside of the healthcare setting, including at sporting clubs and recreational centers, it is imperative to have an AED on hand in the event of a cardiac emergency.